What are the advantages of an early morning workout? An early morning workout will kick-start your body’s efficiency making you able to burn off more calories. Our body is a very intelligent and highly functional “machine”. These exercises will be well worth the effort, and help to give you fresh reserves of energy throughout the day, which will help you to deal better with the challenges of the day. The workouts should commence shortly after you get up. Take care, however, that you do not rush and overdo it. You should try to take it slowly at first, and gradually increase the intensity. Yoga exercises and light power training are well suited to this purpose. It is a good idea to start the day with a glass of lukewarm milk, with a dash of lemon juice. This natural potion, will stimulate your digestive system and your whole circulatory system, in order to summon up the energy required for a morning workout. It also helps you to combat hunger pangs, which would otherwise disrupt your morning training. The preparation for our first workout will help to loosen you up and get your body axis moving, including your spine. Hold your head up and stretch yourself upwards. 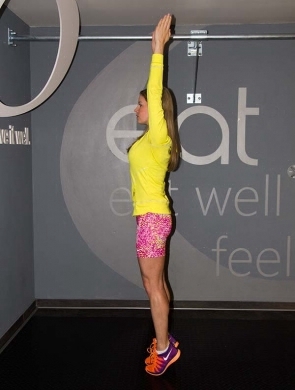 Stand on tiptoes and stretch your left and right arms upwards alternately. Repeat three times within 20 seconds. In the first exercise, we are going to touch the floor for a thorough back stretch. Starting with your head, bend forward slowly and continuously, vertebra by vertebra, until your hands touch the floor. Hold this position for 30 seconds. Try to relax with every deep breath, and gradually return bit by bit to an upright posture. The exercise which follows focuses on strengthening the whole of the torso, including your arms: push-ups. It is important here to maintain a good posture, and really to work only with the elbows. If you are a beginner, first kneel on the floor, or work with a raised surface. We recommend 3 sets of 15 repeats, of 10 push-ups. To involve the whole body, however, even more movement is required. You can achieve this by doing lunges. From a standing position, place one foot in front of you. Here, it is important to bend your knees at the correct angle. You should therefore keep an eye on your forward knee, so that it does not go further than the line of your toes. 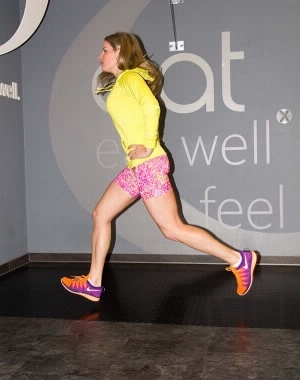 Repeat the workout with three sets of 20 repeats – ten for each leg in turn. To round it all off, we can relax briefly and stretch the lumbar spine, which often tends to tensed up. Adopt a “child” posture, where you lie on your knees, which should be touching your upper body. Hold this position for a minute, and concentrate solely on your breathing. Breathe deeply and direct your breathing into the lumbar region, in order to intensify the stretching. Especially during this stressful period leading up to Christmas, try to make this workout part of your morning routine. Not only will your body benefit, as these exercises will give you a lot of the mental energy and vigour that you need, especially at this time of year. It will also be a good advance strategy, to help stop putting on those unwanted holiday pounds. You can find even more workouts and exercises in our article section for workouts.